Help make our fair great! Enjoy turning your hobbies and talents into blue ribbons! Each year brings new excitement and energy as our community comes together to display over 13,000 exhibits. Find printed fairbooks at a Geauga County Library or the Fair Office. Have questions about entering? Use the following documents from our fairbook to answer questions. Online Entry is now closed for 2018.
Review the rules and classes of the departments you plan on entering by downloading Fairbook above. You MUST purchase an exhibitor's ticket unless Jr. class. Make sure you click on the ticket tab to select your exhibitor ticket - only 1 may be purchased. An animal exhibitor must purchase a $25 exhibitor ticket or membership ticket. You may only make one entry per class for non-animal entries. Junior Fair (4-H Youth) can not enter online - you must bring blue forms to the fair office to register. Deadline for entries is August 8, 2018 at 4:00 p.m.
Read the information below then click on Online Entries button. The Great Geauga County Fair is Ohio's oldest continuous county fair and one of the oldest existing agricultural fairs in the nation. Preparations are now underway and all area residents are invited to plan to enter their exhibits. In an effort to make the fairbook consistent and easier to enter, we have made adjustments to each department especially at the beginning for show times, locations and entry drop off and pickup. All pictures and phone numbers for directors of departments is in the front of the book (page 5). Remember that the Rules and Regulations for Exhibitors is on page 3 and must be followed for each department. Dept 14: Beer and Wine - All new class names and descriptions to allow consistency with other judging competitions. Dept 19: Baked Goods - For juniors and teens, new classes added. Adult sections, classes added to Candy, Cakes and Pastries. Please note, anyone bringing a cake or pie needs a cake or pie box. Dept 20: Domestic Arts - New section (see below) plus premium updates. BABY BLANKET BLESSINGS: To support local families, we have added this class for 2018. The Domestic Arts Department 20 will be donating all blankets entered in this section to the Rainbow Babies Neonatal Intensive Care Unit. All entries will be judged and premiums awarded as they normally would. After judging all entries will be displayed during the fair. Entries will then be taken to the hospital for donation. Thank you in advance for your kindness. Dept 21: Fine Arts - Created a “Reflections” class and “Human Portrait” class for photography along with updating premiums for each section. Dept 22: Flowers - Theme for 2018 “A Trip Down Route 66” for Design Divisions and Garden Club Booth Displays. The Second Show has changes to class orders and Court of Honor. Dept 23: Antiques - Featuring Era is Victorian Period 1875-1900 with updated classes throughout department. Please remember to review all the department information and rules to ensure the best experience possible entering your items in the fair. Since 1823, residents of Geauga County and beyond of all ages have been active participants and enthusiastic supporters of the Fair. In 2017, over 13,000 exhibits were entered for judging at the Fair in a variety of competitions and categories including, livestock, horticultural and agricultural products, Fine Arts, Domestic Arts, antiques and collectibles, culinary and baked goods and many more. 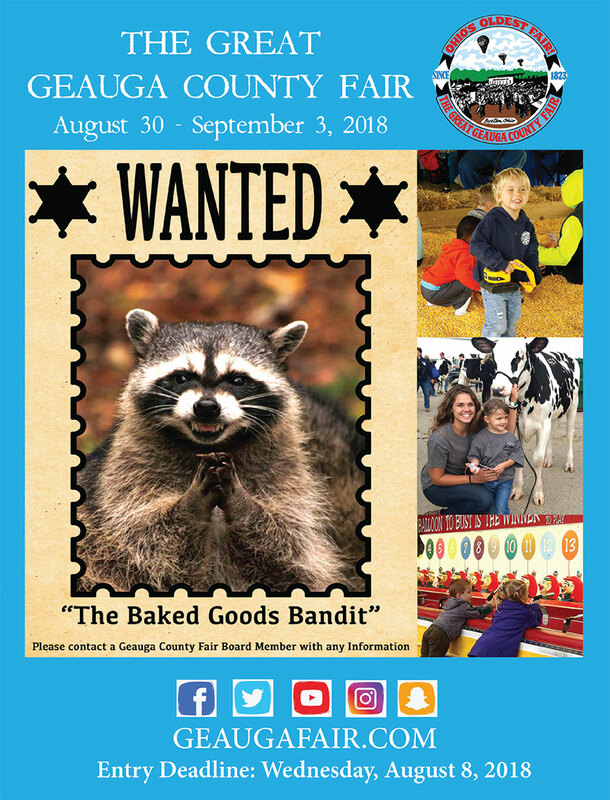 Anyone wishing to enter an exhibit in the Great Geauga County Fair must submit an official entry form (form photos copies are acceptable) to the Fair Office by the entry deadline. No entries will be accepted after this date. You do not have to be a Geauga County resident to enter an exhibit in the Fair. Also, many departments offer special classes for entries by children. The official Fair Premium Book lists the rules, regulations, descriptions and forms for each Fair Department and Class. Fairbooks can be picked up at the Fair Office (hours open) are available or at all branches of the Geauga County Public Library. The Fairbook can be viewed and downloaded above.